Weatherization is the process of protecting your home and family from the elements. Weatherization takes place both inside and outside the home, and can also include projects in your yard. The goal of any weatherization project is to reduce convective heat transfer: the unwanted transfer of heat from one part of the home to another. If you’ve ever caught a chill from being in a drafty room in the winter, you’ve experienced an unwanted convective heat transfer. The heat in the room is “escaping” and the air temperature is decreasing. In this case, you could put on a sweater. But a better decision is to address the room’s heat transfer with a weatherization project. An effective weatherization project will prevent convective heat transfer. The result should be a room with a stable and predictable air temperature. You and your family will notice the improvement right away, when your rooms are more comfortable in heating season and all year ’round. That’s a healthy savings for anyone! There are several weatherization projects that anyone can complete with a few basic tools and the right materials. Weatherstripping is the process of sealing the gaps in window and door frames that can contribute to heat loss. Effective weatherstripping could save 10 to 15 percent on home heating energy bills, according to home improvement experts at This Old House. There are several types of weatherstripping available , so ask the pros at your local hardware or home improvement store for advice on what’s best for your home. Air sealing with caulk is another effective DIY weatherization project. Caulk is a flexible sealant applied over joints and gaps in your home: between your shower and the floor, for example, or between the window frame and the window. When you seal these spaces you keep air from leaking outside your home, and your HVAC system doesn’t have to work as hard to keep your rooms at a comfortable temperature. All you need to get started is a caulk gun and a tube of caulk . Window sheeting and window insulation kits are tried and true ways to air seal your windows and window frames in the winter. The idea is simple: use strong tape to secure a clear, heavy plastic sheet over an inside window frame. The combination of the plastic sheet and the tape will prevent air leakage and heat loss. Department of Energy Weatherization Assistance Program: The U.S. Department of Energy (DOE) Weatherization Assistance Program provides grants to states, territories, and some Indian tribes to improve the energy efficiency of the homes of low-income families. These governments, in turn, contract with local governments and nonprofit agencies to provide weatherization services to those in need using the latest technologies for home energy upgrades. WAPTAC: Weatherization Assistance Program Technical Assistance Center is a detailed reference site for Weatherization Assistance Program professionals and homeowners who want to find the technical information about their programs. The National Association of State Energy Officials State and Territory Energy Offices map has state contact information for homeowners interested in finding weatherization resources and programs in their communities. Utility companies and co-ops often have rebates or low-interest loans available for homeowners who want to use home performance contractors for a weatherization project. Check the inserts in your billing statement, or the utility’s website, for information about available weatherization and home energy efficiency rebates and programs. The American Council for an Energy-Efficient Economy is a nonprofit organization that advocates for energy efficiency “to achieve greater economic prosperity, energy security, and environmental protection” for all Americans. Their residential energy resource portal includes information on home energy efficiency, weatherization, and the Consumer Guide to Home Energy Savings. The Environmental Defense Fund develops policy and business models to improve energy efficiency, grow the economy, and help consumers save money on their home energy costs. Their energy efficiency resources page features studies of the benefits of weatherization, and includes a discussion of on-bill repayment programs for home improvement loans. These programs are becoming more common for homeowners who want to undertake weatherization projects but might not qualify for federal or state assistance. What is a programmable thermostat? Programmable thermostats can trim about $180 a year from your energy bill by automatically reducing your heating or cooling when you need it least. Some thermostats tested by Consumer Reports were easy to set and use but others were so complicated that you might end up spending more on energy, not less. Every family lives differently in their homes, so the programmable thermostat your neighbor just installed may not be the best choice for you. Finding the correct equipment for your home and family is part of what’s called “right sizing” an HVAC system. This means just what it sounds like: designing, installing, testing, and maintaining the appropriate equipment to maximize your family’s comfort and health, and minimize your home heating and cooling energy bills. 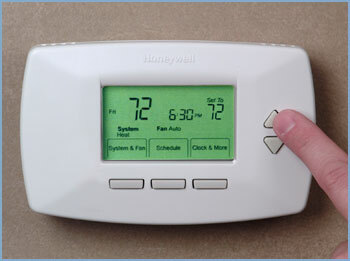 A programmable thermostat is a sensor connected to your HVAC (Heating, Ventilation, Air Conditioning) system. It can turn your HVAC system on and off, in order to maintain a comfortable temperature. There are many different types of programmable thermostats, but they all work according to the same principles. What are the benefits of a programmable thermostat? Set it and forget it! If you have a regular thermostat in your home you might find yourself adjusting it several times a day, as you leave for work and come home, or when you go to sleep and wake up. The most basic programmable thermostats will do this for you. All you have to do is input a time of day and temperature. Your new thermostat will take care of the work. More advanced programmable thermostats are sometimes called “learning thermostat ” title=”learning thermostats” target=”_blank”>learning thermostats.” Learning thermostats are basic programmable thermostats with additional sensors and software. The sensors are activated when you or your family move in and out of rooms. Software connected to the sensors then activates your HVAC system to raise or lower the room temperature to the comfortable level you programmed into the thermostat. Over time, these thermostats learn when you are home and when you are away, and program themselves to manage your HVAC system for you. Some of them are even connected to the Internet, so you can use your laptop or phone to control your home’s temperature while you’re away. Is a programmable or learning thermostat the right choice for you? Get your home’s full heating energy assessment today: it’s fast and accurate and will give you actionable information to take the next step. Want more ideas on how to save money on your home energy costs? Just sign up for our Home Energy Performance Newsletter. It’s full of the information and ideas you need to make your home less expensive to operate and more comfortable – and healthier – to live in. Heating, Ventilation, and Air Conditioning (HVAC) systems are one of the best places to look for savings in your home. 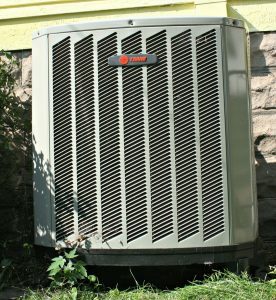 If your heater or air conditioner are more than 10 years old, if you think they’re running a lot, or if you can take advantage of a tax credit for energy efficient appliances, you should add HVAC system upgrades to your home improvement checklist. According to the United States Energy Information Administration, home HVAC systems account for nearly 48% of a home’s total energy consumption. There are several parts of the system you can improve, independently or together. You may want to consider a programmable thermostat set to adjust your home’s temperature for the winter heating season and the summer cooling season, and to adjust based on time of day. Why pay to heat or cool an empty house? Programmable thermostats are easy to install and use, and will pay for themselves with the money you save on your heating and cooling bills. One of the most cost-effective upgrades to an HVAC system is air sealing. If your home is drafty it’s a good candidate for air sealing. A trained and certified contractor can find the cracks and gaps where air is leaking in or out, and seal them with caulk and weatherstripping. This will make you and your family more comfortable, and reduce your heating and cooling energy costs. Are HVAC system upgrades the right choice for you? Get your home’s full heating energy assessment today: it’s fast and accurate and will give you actionable information to take the next step. Understanding home heating energy performance just got a whole lot easier. The new Heating Energy Assessment Tool (HEAT) from AREVS is a RESNET Approved, easy to use web-based application that tells home energy professionals, homeowners, and renters whether or not a home is in need of energy retrofits or upgrades. Using patented algorithms that are normalized for house size and geographical location, and information from its utility bill, HEAT provides a heating energy audit for a home in under 5 minutes. A simple A+ through F grade range gives instant understanding of home heating performance. . Try it today for free. •	A “first line” assessment tool to determine if a home needs further envelope assessment. •	Can be used for performance-based quality assurance verification for homes that have undergone weatherization upgrades. •	Eliminates need for on-site inspections. •	Offers opportunity for en masse initial ratings. •	Pre-qualified leads sent directly to your sales team. •	Use HEAT as a complement to asset-based rating programs. •	Economical and easy to use. •	Information from a single energy bill results in a custom HEAT Assessment in less than 5 minutes. •	Determine energy consumption and costs for heating, air conditioning and hot water. •	Provides an accurate assessment of whether a home is in need of energy retrofits or upgrades. •	Provides an accurate assessment of whether a home is in need of a further envelope assessment from a certified RESNET professional. •	Verify energy savings achieved through weatherization and energy upgrades. •	Know a home’s PITI+E payment: Principal, Interest, Taxes, Insurance, and Energy – the true cost of home ownership. RESNET is offering both home energy professionals and homeowners a one-time free Heating Energy Assessment to demonstrate how HEAT works. Afterwards, you can purchase a detailed HEAT Rating Report from AREVS with your home’s exact A+ through F alpha grade, unique Energy Rating Number, and heating and cooling fuel consumption and cost data. We’re ready to put a long winter behind us, but we also want to harness some of that cold air for the dog days of summer. For many people, air conditioning is the beginning and end of the story. But air conditioning is just one of the ways that you and your family can keep cool this summer. The real key for keeping cool is to keep air moving throughout your home. Here’s how to keep cool this summer: easy tips for everyone to try. If you can, open the windows to let air into your home. Not only will this help you become acclimated to warmer temperatures, but the air circulating through your rooms will help keep them cool. Use a floor fan or table fan to pull air into your home. Strategically placed fans away from windows will move air deeper into a room, helping air circulation. Install a ceiling fan in your bedroom to help you sleep more comfortably, and another in your living room to keep your family cool during the dog days of summer. Tune up your air conditioner. The average air conditioner uses as much as 500 watts of electricity during the cooling season. In many parts of the country, August and September are hotter than July! Older or inefficient models will use more, costing you more this summer. 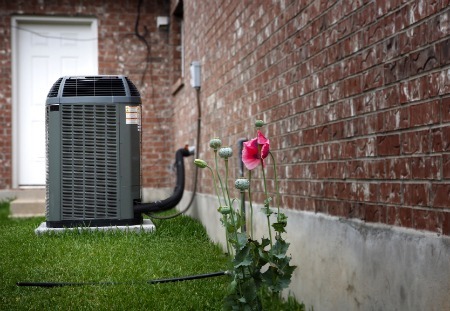 Even if a new air conditioner isn’t in your budget, there are steps you can take to improve your current model’s performance. One painless step is to raise your thermostat’s temperature during the day. Why pay to cool the air if no one is at home? Just a two degree increase can save big money each year. You can do this manually, or install a programmable thermostat . There are many models available, from a basic digital timer to advanced “learning” thermostats that adapt to the way you live in your home. If you’re not sure where to begin, a certified home performance professional can help you rate your home’s energy efficiency and find the best deals for your wallet and your home. They can help you determine the right size and model air conditioner for you and your home, take advantage of rebates and incentive programs, and make sure your home is performing at its peak. Is your home ready for fall weather?